Fujifilm Prescale® is a unique, affordable and easy to use tool that reveals the distribution and magnitude of surface contact pressure in your fuel cell stack. 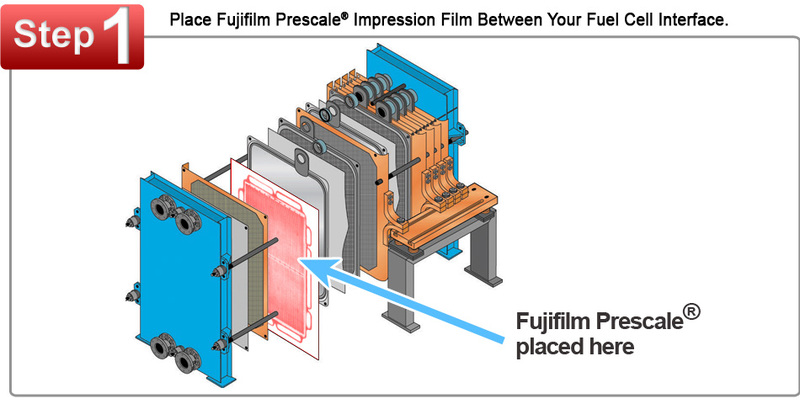 Fujifilm Prescale® sensor film is used to measure surface contact pressure between gasketed diffusion layers. Fujifilm Prescale® reveals both pressure distribution and magnitude between these surfaces in a dramatic surface "map." When placed in your fuel cell stack, the film instantaneously and permanently changes color in direct proportion to the actual pressure applied upon it. Philosophically similar to the indication given by Litmus paper. Precise pressure magnitude is then easily determined by comparing the resultant color intensity to a standardized color correlation chart. No training or instrumentation is required.